Great article. I love seeing this survey every year. Here is how I am dealing with the lack of course dilemma in my own way. Since there are not enough courses near my home (Suburban Boston, MA) I took the initiative this fall and planned out 2 different courses on nearby conservation land. Using two portable baskets I am able to carry them into the woods (or use a two-wheeler) and set them up at predetermined positions, throwing 2 to 4 times at the same basket from different directional T-boxes. By throwing from multiple sides and angles at the same basket, this reduces the hassle of moving the baskets too many times. Each whole is a carefully mapped out and documented for exact distance via Google Earth, which helped me set the various appropriate pars for each hole. It is all documented via detailed photos of each hole on Google Photos. Since this is conservation land, I will never be able to have “real” T-boxes, but having preset positions marked out by large sticks placed in a rectangle (stop laughing…) provides a serviceable T-Box. I’ve convinced several of my DG buddies to play the courses, and surprisingly, they actually liked them. Lots of variation in terrain and elevations, since the land is a former quarry site. The key is to own two of the 15 lb portable baskets (ie. DiscCatchers). The beauty of this is that now I can play anytime within minutes of my home, solo or with friends. So cool. Thanks for reading this drivel, hope it wasn’t too boring. I recommend this approach to anybody with too much time on their hands. What was the means of surveying? Where were people surveyed from? Was it fairly evenly distributed everywhere or a majority of responses from one area i.e. East coast etc.? 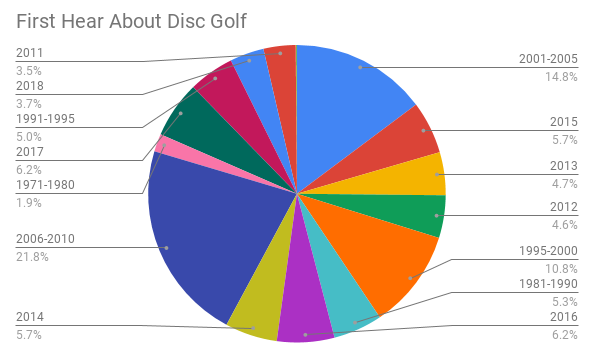 We have held a State of Disc Golf survey every year for the last few years, always in January. It is announced and shared through all of our social media and passed around the disc golf community. This year we had just over 6,000 survey participants. 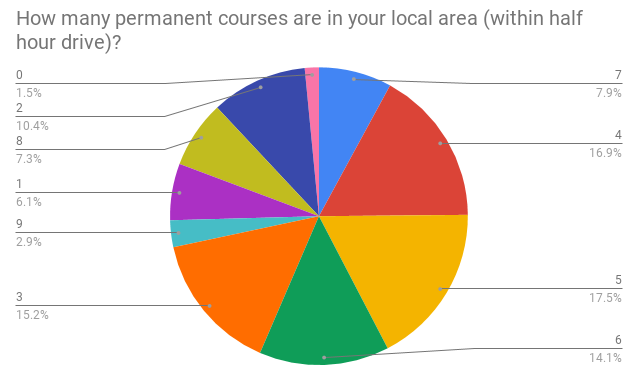 You can look at the earlier blog post about the demographics of the survey to see how survey participants were spread around geographically. We’ll have more details forthcoming.